3. Do not dry it with a hair dryer. Material: New Zealand deerskin, top genuine leather, very soft and comfortable to wear. Liner: 100% wool lined, keep your hand warm in winter. Exquisite workmanship: 100% hand made, even the stitches of the fingers are made by skilled artisans, to keep the leather gloves perfect format, flat and not tight. 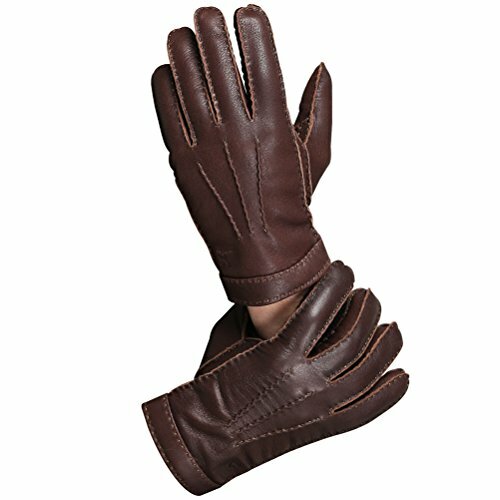 Versatile Cold Weather Gloves: Fashion gloves for men can fit great with any outfit. Great for both casual and formal occasions. Perfect for driving, cycling, motorcycle, outdoor, work, dress up, business, travel, and city-life. Nice gift packaging for birthday, anniversary, ceremony, Father's Day, Thanksgiving, Christmas, and etc. If you have any questions about this product by CHULRITA, contact us by completing and submitting the form below. If you are looking for a specif part number, please include it with your message.